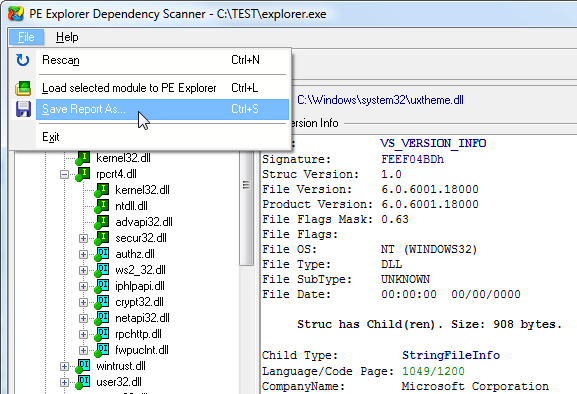 PE Explorer DLL Scan Tool: View DLL dependency checker, full path to file and version information. I chose PE Explorer because of its Dependency scanner. I do a lot of work on legacy code that calls DLL's. Knowing which DLL's are called and from which programs is quite helpful. Additionally, the resource editor has been quite useful. PE Explorer is really a great product for reengineering. I was looking for a simple DLL viewer, something like MS Visual Studio's Dependency Walker. But PE Explorer's design and features killed me! One thing I really like about PE Explorer is the Dependency Scanner, I find it useful to find out what a program is up to or doing by tracking down what a program is accessing and it gives me a better understanding of my computer and the files on it. PE Explorer can help you learn the minimum set of DLL files required for the EXE file to load and run, and the complete path to modules loaded by the EXE file. The dependency checker tool allows you to to view DLL dependencies without executing the code. Software dependencies are modules, or pieces of code, which an application requires in order to load and run correctly. Such dependencies are often found in the operating environment and not included in the application in order to save space and time. By determining an unknown binary's dependencies, your can learn more about what the binary is and how it works. Load time dependency modules may also have dependencies of their own. Dependency Scanner recursively scans all modules linked to by a particular PE file and builds a hierarchical dependency tree of all dependent files (a graphical representation of all the modules an executable is statically linked to). Dependency Scanner also detects delay-load dependencies. Detecting dynamically loaded libraries is not currently supported. Dependency Scanner produces diagrams of dependent modules, provides full paths to files and version information (File and Product version numbers, Language/Code page, Product and Company name, copyrights, etc). It is helpful in discovering missing or invalid modules, import/export mismatches, circular dependencies and other module-related problems, and in troubleshooting system errors caused by the loading or executing of modules. For each module found, it lists the full path to the file and the version information. Then you can easily examine this particular linked module in PE Explorer and get back again to the previously selected executable. This tree also shows which dependencies could not be found on the system, were invalid, or had errors. The output can be saved into the text format.